Ideally you should start with a good quality coffee, such as Arabica or other premium blends, that is as fresh as possible. It should be noted that freshness doesn't necessarily correlate with when the coffee was actually roasted. For instance, a coffee that was roasted six months ago but was vacuum-packed in a can with minimal residual oxygen would be fresher than a coffee roasted a month ago but left open to the elements. Think of coffee as fresh produce. The factors that will reduce its freshness are oxygen, light, heat, and moisture. The type of package that contains the coffee and how it was initially packed is critical to the freshness of the coffee inside. In general, the more oxygen left in the package when the coffee was first packed the quicker it will stale. Coffee that is packed (vacuum packed or nitrogen flushed) in a can with minimal residual oxygen tends to keep coffee fresher longer than that which is packed in soft bags. Always store your coffee in an airtight container away from direct light, heat and exposure to moisture. Ground coffee will begin staling soon after the package is opened, so storing it in an airtight container is crucial. An airtight container keeps out odors and protects the internal moisture of the coffee bean, in the case of whole bean. Direct light and heat will begin to degrade the coffee oils, and will affect the flavor and aroma properties. 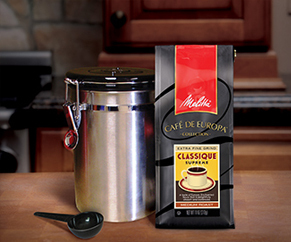 Melitta packaging goes a long way to ensure the freshness of coffee, but once the can or the bag is opened oxygen, light and heat will affect whole bean and ground coffee if not protected from these elements. To ensure at ­home freshness, coffee can be stored temporarily in opaque, tightly sealed canister and kept in a cabinet or pantry at room temperature. Coffee can also be stored in the refrigerator, with all same precautions taken. It is not advisable storing coffee in the freezer unless properly protected, airtight containers are crucial; freezing will negatively impact the natural oils and crystallize the moisture. If not properly protected ice particles will adversely affect the flavor and aroma qualities of the coffee. Coffee is roughly 98 percent water, so water quality plays a critical role in the end taste of your coffee. When making coffee, you should use only filtered tap water or bottled water. We do not recommend using distilled water which is missing minerals that contribute to the water's taste and aid in extraction. Water should be fresh as if it has been sitting too long or has been heated then cooled it will be missing the dissolved air that is an important component of the water's taste. The water should also be cold as hot water has lost some of its dissolved air, and may have picked up minerals or solubles from your pipes. 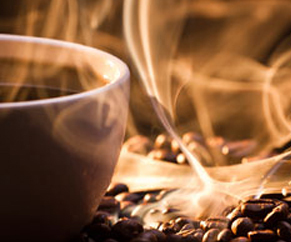 The optimal temperature for coffee brewing is 195 - 205 degrees Fahrenheit. If the water is too cool, the brew will be under-extracted. The temperature range during brewing should also not vary by more than a few degrees, or extraction will not be optimal. Many drip coffeemakers do not heat the water to this level so attention should be given to this attribute when purchasing an electric coffeemaker. In general, whole bean coffee stays fresh longer than ground coffee because there is less surface area exposed to oxygen. 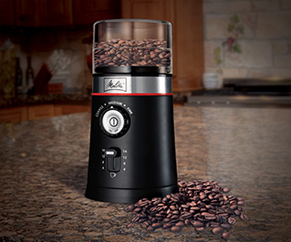 By grinding the beans each time you brew, the freshness is preserved. This is only true, however, if the package form which contains the whole bean and ground coffee is the same. Whole bean, if left in an open container, begins the staling process immediately as it is in open contact with oxygen. If left in the open for a prolonged period of time, the whole bean coffee will be stale before you ever grind it. Different brewing methods also have different grind requirements, as the amount of time the coffee and water spend together affects the flavor elements that end up in your cup of coffee. In general, the finer the grind, the higher the coffee extraction will be. When using finer grinds of coffee, it is possible to actually use less coffee due to the higher extraction levels. The most commonly found coffee grinders look like miniature blenders and they operate by chopping up the beans with two or more sharp blades spinning at high speeds. Blade grinders are not able to produce a consistent particle size and the size of the grounds in any particular batch will be quite varied. As a result, coffee extraction will be uneven, with the larger particles under-extracting (producing thin, weak coffee), and the smaller particles over-extracting (producing bitter coffee). These varied grinds do not "even out. " This situation is undesirable for brewed coffee. Less common are burr grinders where the beans are placed in a hopper on top of the machine, and they feed between two metal rings (burrs) and down into a bin. One of the burrs is fixed in place and the other rotates a small distance away from it; the beans are fed into a hole in the center of the top burr and are sliced down by the burr teeth as they make their way between the two burrs to the outside where they are ejected. Manually operated versions can be purchased, as well as the electric models. Manual grinders are essentially burr grinders without the electric motors. Some of the better quality manual grinders produce excellent quality grinds. The downside is convenience. It takes a significant amount of grinding to produce enough for a pot of coffee. The grinding time required to produce a particular quantity increases with the fineness of the grind. Choosing a Coffeemaker The type of coffeemaker that you use has a direct correlation to the end flavor in your cup. The two key variables that matter most in a coffeemaker's performance is the water temperature and the brew process time as both directly impact the extraction level of the coffee. Many drip coffeemakers do not heat the water to this level so attention should be given to this attribute when purchasing an electric coffeemaker. The coffeemaker's brew cycle is also important as the longer the brew cycle, the higher the extraction. At the extreme, press pots and percolators have the longest brew time and thus the highest extraction levels. 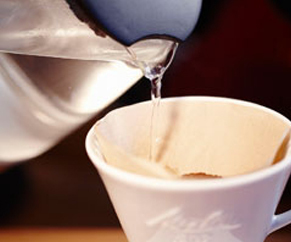 A standard cup of coffee is based on six ounces of water. For medium grind coffees, it is traditionally recommended that two tablespoons (roughly 10 grams) be used per standard six ounce cup. For finer grind coffees, it is recommended that only two teaspoons be used per six ounce cup. As coffee taste is a very personal matter, it is recommended that you adjust upward or downward the amount of coffee you use until you find the right portion for your own tastes. These are added to the coffee after it is brewed. In general, this type of flavoring tends to overwhelm the actual flavor of the coffee. The best temperature for brewing coffee is between 195 F and 205 F. If using a manual drip coffee maker, this can be achieved by letting your kettle rest 30 seconds after coming to a boil and then pouring the water over the coffee grounds. Care must be given not to over-extract or under extract coffee. If too little is extracted from the ground coffee (because the grounds are too coarse or the water contact time is too short), then you will not get all the essential flavors from your coffee. If too much is extracted (the coffee was ground too finely or the contact time is too long), then the coffee will be bitter. 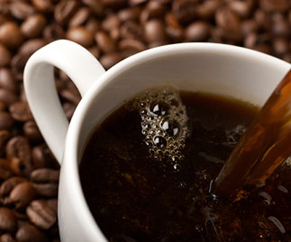 Freshly-roasted, freshly-brewed coffee should never sit around, but should be enjoyed as soon as possible. If coffee sits on a burner or is reheated, it will have a scorched taste and will lack the aromatic complexity of freshly-brewed coffee. Adding natural ingredients such as ground cinnamon, cocoa powder, bits of vanilla bean, ground roasted nuts, citrus peel, figs, etc. provide a very unique coffee experience. Natural ingredients should be added to the ground coffee just before brewing. Chocolate syrup or hot chocolate mix can also be added to brewed coffee. With flavored coffees, flavoring is evenly sprayed on to the roasted coffee prior to packaging. This type of flavoring typically does not add any calories to the coffee and depending on the brand offer a consistent taste. These are added to the coffee after it is brewed. In general, this type of flavoring tends to overwhelm the actual flavor of the coffee. The sweetness of these products varies by brand, but they can be sweet enough to mimic the addition of a packet or two of sugar.